Here I was one day after a party with all kinds of candy left over. I didn't want to just eat all the candy so I decided since as a little girl pies was a favorite game we played of mine. It was time to invent some I would love! Well it didn't stop there. I have such a busy life, work, blog and invent new recipes for brands. I thought what would still be no bake, quick, easy and fun for all the upcoming Holiday and parties? I had leftover pudding, fruit cups and this became a fun project. It really was after Halloween but not it won't matter, they were so good I will make them on purpose. I bought pudding cups for the little babies that came for trick or treating, had bags and bags of candy bars and started to think of my favorites pies. Below are some combinations that everyone loved and now will want me to make some of these again. Easy desserts for you and the kids to make too! Lets get started shall we? Let your imagination get creative and make some great pies! Here is a video too! Graham cracker mini tart pies (found in the grocery store premade) or buy a full size crust and make one big pie! Whipped cream in a can. 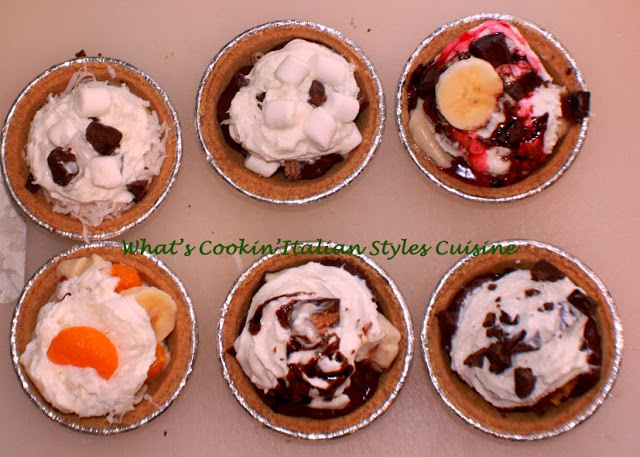 Pudding cups assorted flavors, vanilla, butterscotch, chocolate, lemon, key lime, banana cream. Garnishes: nuts such as almonds, macadamia, peanuts, walnuts, pecans Toppings such as caramel, chocolate, strawberry or any other ice cream toppings or use jam heated up in the microwave a few seconds. Directions remember you can mix and match whatever you and your family likes. Just need to start somewhere. Spoon chocolate pudding into a pie tart. Add crumbled kit kat bars and marshmallows. Top with whipped cream and drizzle with chocolate sauce. Spoon chocolate or vanilla into a pie tart. Add broken pieces of your favorite candy bar top with whipped cream and favorite ice cream sauce topping. Spoon vanilla into a tart, add banana, oranges, coconut and top with whipped cream. Drizzle with your favorite ice cream topping. Spoon lemon pudding into a tart, add fresh blueberries to the pudding. Top with whipped cream, drizzle with matching heat blueberry jam. Spoon butterscotch pudding into a tart, add chopped heath bars or reese cups. Top with whipped cream and caramel. Spoon vanilla pudding into a tart, add slices of banana and crushed pineapple, mini chocolate chips or chopped candy bar of choice. Top with whipped cream. Drizzle with chocolate, strawberry and caramel for a banana split pie. Spoon vanilla pudding into a tart, add chopped almond joy bars. Top with whipped cream and drizzle with chocolate topping syrup and chopped almonds. What's your favorite dessert pie? Go ahead and make up your dream pie, it's so easy!